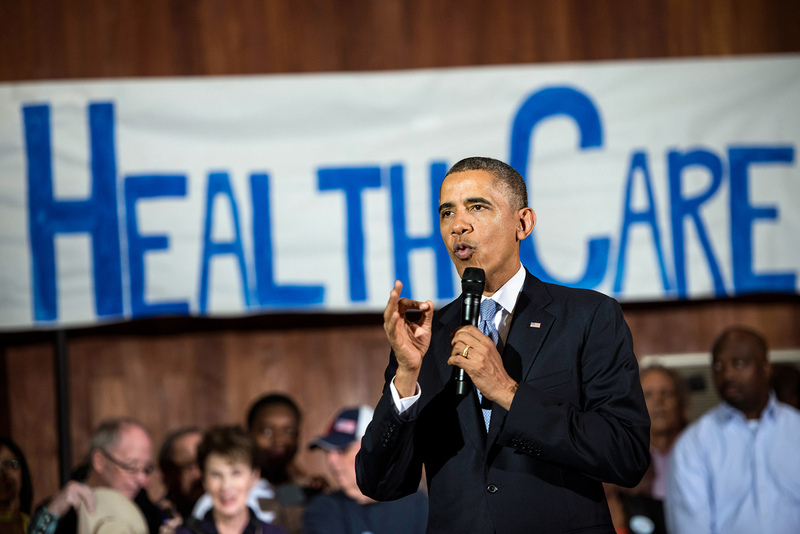 Obama Renews Call For A 'Public Option' In Federal Health Law : Shots - Health News The president made the proposal as part of a comprehensive look at the Affordable Care Act's legacy in an article under his byline in JAMA, the top journal of the American Medical Association. President Obama speaks in Dallas in 2013 about the technical problems that affected the initial rollout of the Affordable Care Act. Now, citing the law's success, he is urging Congress to expand the insurance offerings. But in a "special communication" article published Monday on the website of JAMA, the American Medical Association's top journal, the president says a lack of competition among insurance plan offerings in some regions may warrant a new look. "Now, based on experience with the ACA, I think Congress should revisit a public plan to compete alongside private insurers in areas of the country where competition is limited," Obama writes. The president calls on Congress to take more steps to rein in the cost of prescription drugs and make government assistance more generous for those who still cannot afford health coverage; he also urges the 19 states that have not yet expanded the Medicaid program under the health law to do so. The public option has been a point of controversy from the start. It was included in the version of the health law passed by the House of Representatives, and had support from most Democrats in the Senate, before it was dropped. Many liberals hoped — and conservatives feared — that having the government provide insurance alongside private companies would be a step toward a fully government-run system. Presumptive Democratic presidential nominee Hillary Clinton — under pressure from Sen. Bernie Sanders' call for a single-payer government system — in February endorsed the idea of including a public option to allow people age 55 and older to purchase Medicare coverage. On Saturday, as part of a deal with Sanders, Clinton announced she will also "pursue efforts to give Americans in every state in the country the choice of a public-option insurance plan," which is broader than what Obama is endorsing. But even if Clinton wins and the Democrats take back control of Congress in November, a public option remains a political long shot. Obama's article, titled "United States Health Care Reform: Progress to Date and Next Steps," is apparently the first by a sitting president to be published by the prestigious medical journal. Along with these recommendations for further action, Obama's article includes a justification for the federal health law and statistics on how its implementation has improved insurance coverage for patients and improved health care quality. Kristie Canegallo, the White House deputy chief of staff for implementation, says the article grew out of a comprehensive review of the law that the president requested from his staff late last year. The review was to look at "what's working, what's not, and what we should do about it," Canegallo says. Upon receiving the review, she adds, Obama "thought it was important to share some of this publicly." Among those parts of the law the administration says are working are the coverage provisions. "The number of uninsured individuals in the United States has declined from 49 million in 2010 to 29 million in 2015," the president writes. The article also says that the health law has played a substantial role in slowing the rate of health spending. "While the Great Recession and other factors played a role in recent trends, the [president's] Council of Economic Advisers has found evidence that the reforms introduced by the ACA helped both slow health care costs growth and drive improvements in the quality of care," says the article. Jason Furman, chairman of the council, says the continuing slow growth in health spending so many years out from the recession makes the argument by some other economists that the turndown in the U.S. economy was mostly responsible for the slowing of health spending "absurd at this point." While most of Obama's journal article is a chart-driven, footnoted recitation of the impact of the health law, he does use his perch to suggest that the current state of politics in Washington threatens progress going forward. "Any change is difficult, but it is especially difficult in the face of hyperpartisanship," he writes. "Republicans reversed course and rejected their own ideas once they appeared in the text of a bill that I supported." Republicans are continuing their assault on the health law. Just last week, two House committees released a joint investigative report and held two hearings asserting that the administration is illegally providing funds to help lower-income individuals pay for their health coverage. That claim is also the subject of a lawsuit in federal court. The White House, however, remains unimpressed by the Republican claim. "The Department of Justice ... has made clear we have a permanent appropriation for this," Canegallo says.